Providing a systematic and complete overview of the highest scholarly quality on Tantric mantras in Hinduism, this book presents a summary on the nature of Tantric mantras, their phonetic aspect, structure and classifications. Additionally, it explains the metaphysical-theological nature of Tantric mantras and gives an introduction to their beliefs and practices. In individual chapters, Andre Padoux discusses the extraction and examination of mantras, certain characteristics such as their "perfect nature" and their imperfections, and he describes certain mantrics practices. 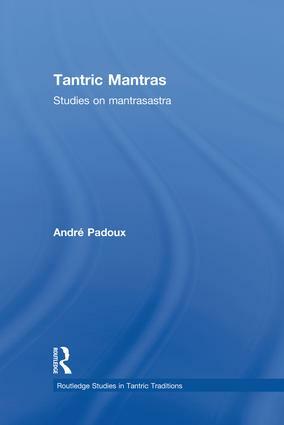 For the first time, Andre Padoux' work on Tantric mantras is made accessible to an English-speaking readership. This book will be of great interest to scholars of Religious Studies, Theology, Indology, South Asian Studies, and Asian Religion. Andre Padoux has had a distinguished career as a diplomat and then as a scholar of Sanskrit, notably of ‘Kashmir’ Shaivism and Shakta Tantrism. He was Director of Research at the Centre National de la Recherche Scientifique, Paris, for many years. He is a renowned expert on the ‘science of mantra’ (mantrasastra) and has published important articles in this field. Routledge Studies in Tantric Traditions is a major new monograph series which has been established to publish scholarship on south, east and southeast Asian tantric traditions. The series aims to promote the serious study of both Hindu and Buddhist tantric traditions through the publication of anthropological and textual studies and will not be limited to any one method. Indeed, the series would hope to promote the view that anthropological studies can be informed by texts and textual studies informed by anthropology. The series will therefore publish contemporary ethnographies from different regions, philological studies, philosophical studies, and historical studies of different periods which contribute to the academic endeavour to understand the role of tantric texts and their meaning in particular cultural contexts. In this way, the series will hope to establish what the continuities and divergencies are between Buddhist and Hindu tantric traditions and between different regions. The series will be a major contribution to the fields of Indology, Sinology, History of Religions, and Anthropology.